After over two decades of collecting carcass data, retaining ownership and operating our own feed intake research facility we have a pretty good idea of how Circle A genetics perform in the feedlot and what kind of premiums our customers can expect to receive when marketing on a value-based grid. Circle A Feeders is a 5000 head, feedlot all under one roof designed to capture added value and increase returns for Circle A customers. Circle A is so confident in the ability of our cattle to make money that we are willing to put our money where our mouth is by buying customer calves for top of the market plus additional premiums. We take any risks and share the rewards with our customers, right up front! Isn’t it time you were paid more for your calves? 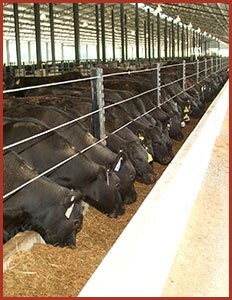 The goal is to fill the feedlot with the highest quality calves available. To qualify, the calves must be sired by a bull or out of a female purchased directly from Circle A Angus Ranch. The calves must weight between 600-900 lbs., have two complete rounds of vaccinations and be weaned for a minimum of 45 days. They must also be tagged with “Circle A” tags or MFA Healthtrack tags, be less than 11 months of age and have been started on feed. Contact Circle A at least one month prior to expected delivery to have your calves screened and to arrange a delivery date and time. Upon delivery to the feedlot, producers receive top of the market for their region from the State of Missouri market report as a base price. 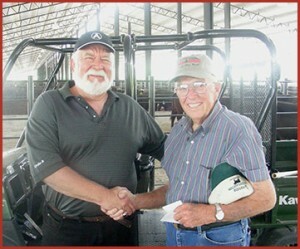 Producers receive another $10 per head for calves out of a Circle A female. And, of course, there is no commission charge. Finally, a program that clearly rewards you for delivering high-quality calves. For further information on payment, delivery, directions, age and source contact information or official forms for delivery please see the Circle A Buy-Back Guide.